Meet the hiring manager, Luanne. She’s guarding your dream future job. She’s ten times more likely to hire you if you’ve held internship positions. Internships give you inside job knowledge, valuable, relevant experience, and networking worth its weight in gold. Finding internships is about the most important thing a college grad can do. The good news is, it’s easy once you know the steps. Where to find internships quickly. How to get an internship fast, without a lot of wasted effort. The best internship websites and internship finders to get you hired faster. Tips and examples of how to find internships with networking and job fairs. How to Google internships near me to fast-track your career. Knowing how to get internships isn’t rocket science. You’ve got several weapons in your arsenal to help find an internship fast. Here's a list of the best internship resources. Use Internship Finders or internship search engines like internships.com. You can also Google internships for great results. Try adding your location to refine your search: internships near me, or internships california will do the trick. See a list of the best internship websites below. Take Advantage of Social Media. Make sure you follow companies you'd love to work for. Most organizations nowadays post information about available internships on their social media profiles. Browse Regular Job Boards like Indeed Glassdoor, or Monster. As with Google, you can filter for your dream internship location: San Francisco, New York City, Washington, DC? Sky is the limit! Go to Job Fairs. Sound outdated? That’s why most graduates avoid them and why you’ll stand out when you don’t. Go late to the event to get more time with hiring managers. Learn Networking. Most people think that means calling your dad’s friends. Read up on informational interviews to supersize your social muscle and find internships fast. Visit a Local Career Center and speak with career counselors—they'll tell you everything there is to know about about internship opportunities in your area. Plus, you can always count on free advice on the best career paths to choose. Cold Call Companies You Love. Seem like a stuttering, sweating nightmare? Call 15–20 companies and shrug off “no” by asking, “Can I be your first?” and “Who else can I talk to?” Stick to smaller companies for better odds—and better summer internships. Is there really a special way to ask for an internship? Know how to find an internship coordinator first. Use LinkedIn’s advanced people search to nail it quickly. Ask politely. Hiring managers are busy. Respect their time by knowing how to email them. Be brief, and take no for an answer. But—turn no into another opportunity by asking for another name. Why do 63% of hiring managers want personalized resumes? Customizing your resume—and your interview style—make you stand out like a klieg light. Learn key facts about the enterprise and the internship on offer. Then tweak your resume to fit it like a tailored Zenga suit. Stick around. We’ve got a list of 10 internship finders below, plus dozens of great tips for how to get an internship. Pro Tip: Want to know how to get an internship at Google? Google “Google internships” Then use the methods in this article. Check out Google’s student careers page too. What’s the obvious answer for how to find an internship? Internship finders are powerful online resources. They list thousands of intern positions around the country and the world. But—they pit you against a horde of other applicants. Use them to find internships anyway. They’re quick, and they give real results. Below are the best internship search engines. Also check regular job sites and even plain ol’ Google. 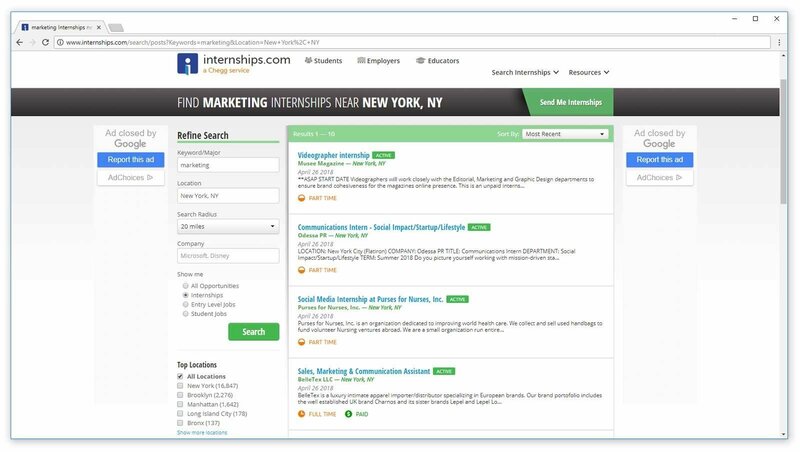 Internships.com is a respected site listing over 6,000 high school and college internship listings. Is internships.com legit? The jobs are real. They’re searchable by date and career. You can find both full-time and part-time internships there. Internships.com reviews online are largely positive. InternshipFinder.com shows 3,500+ positions in the US and UK. It’s a division of M&L Research, an industry-specific employment data firm. Idealist.com is different among internships websites. It lists 800+ internships and 12,000+ unpaid internship programs and volunteer positions with firms that try to do good things in the world. GlobalExperiences.com This internship site hosts 4,000 employers in 11 cities worldwide for an international experience. Your School’s Internship Website. Why this? Networking. On your college's career site, you’ll find a small number of jobs posted by alumni. That puts you in the VIP line for the positions. Pro Tip: How to Get an Internship with Internship Websites. Set your search criteria for career type, location, and date posted. (You can even search exclusively for online internships.) Set up SMS or email notifications so you don’t miss opportunities. Last, take a few minutes to personalize each resume and cover letter you send. 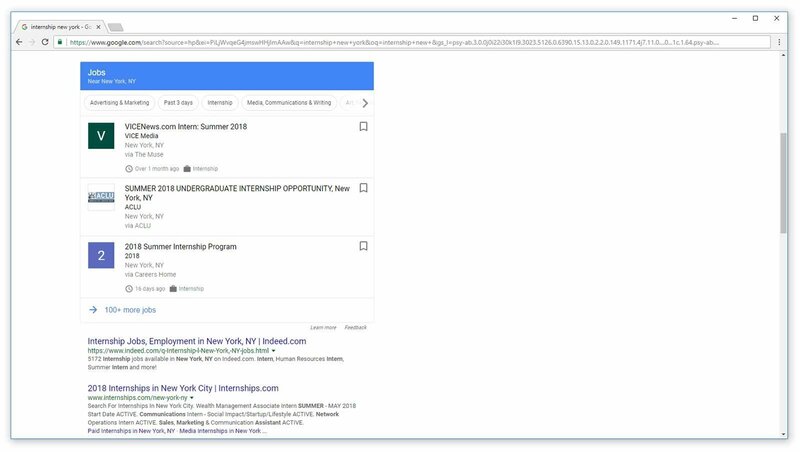 Google has a built-in internship search engine. The regular job search sites do just fine as internship finders too. Indeed Job Search. How to get an internship with Indeed? Type “internships” into the search field. (Or summer internships, engineering internships, marketing internships, etc.) Then specify a location. You'll get hundreds of internship and job listings. Glassdoor Jobs can help you find job and internship positions. Use it like Indeed.com. As a bonus, it gives valuable info about companies from previous interns. LinkedIn is the world’s most popular networking site. It also packs in 76,000+ high school and college internships. Plus, it has a very clear and easy application process. I’ll show you how to ask for an internship on LinkedIn below. Google for Internships may come as a surprise. Just Google internships and you’ll get thousands of results. Want to know how to find internships near me? Google knows where you live. You can also give it a hand by adding your location to the search. Refine your search by job type—for instance: public relations intership boston—and set up saved searches and alerts. Monster works just like Indeed or Glassdoor for internship search. It’s a traditional job search site with powerful intern capabilities. Pro Tip: Not sure what internship jobs are right for you? You can use an "Internship Predictor" by Internship.com. Its purpose is to help you figure out what kind of internship and career field might suit you best. Even if you're looking for an internship just to get the required college credit, it might turn out to teach you a lot about various exciting career fields! The intern websites below are often searched, but aren’t the right internship finders. YouTern Uses Indeed’s job search engine to find internships. Save your time and effort if you’ve already used Indeed. Looksharp.com is a defunct internship site bought by Wayup. Is Looksharp.com legit? It was, but you can’t find looking sharp internships anymore. Internmatch.com is another internship website bought by Wayup, then abandoned. Intern.com is an out-of-business former internship search site. Pro Tip: Taking the time to learn how to find an internship? You’re already ahead of the pack. A National Association of Colleges and employers study shows 91% rank job seekers' previous work experience as one of the most important factors for application success. Still wondering where to find internships? Imagine it’s five months from now. You also got your dream job. Maybe you found it on the internship websites. But—it’s even money you got it networking or at a job fair. Internship finders aren’t the best way to get hired. Come prepared. Bring lots of copies of your resume. Research openings on your school’s career fair page. Learn as much as you can about your potential employer. Study the job description. Dress well. Prep an elevator speech to cover all the bases fast. Plan to spend some time. Arriving early makes a good impression. Staying late gives more time with hiring managers after everybody else goes home. Start with your alternates. That lets you hone your pitch with lesser internships. Move on to your favorites after you feel confident. Be interested. Do more listening than talking to make the best impression. Answer questions, but don't drone on about yourself. Visit job fairs at other schools. If even one lets you in, you’ll double your odds to find an internship. Pro Tip: Trying to find summer internships for high school students? Internships.com has great listings for summer internships for college students and high school students. Just type “high school” in the search box. Networking is a buzzword. It doesn’t mean anything. You either have a great network or you don’t. Right? Done right, networking can be the best answer for how to find internships. Use informational interviews to grow your network. That means calling the company you're interested in. 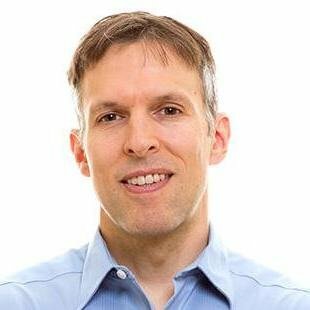 Career expert Steve Dalton, author of The 2-Hour Job Search, says: reach out to employees at companies you want to work for. Ask if you can talk to them about their work. Be interested. “Interested is interesting,” says Dalton. Being interested creates liking. That gives you an advocate within the company and multiplies your odds to get an internship. Even informational interviews can be stressful, that's true. The fix? Practice mock interviews with your friends or family members. It will make you feel prepared when the real interview comes. Up next: How to find an internship nobody else even heard of. Pro Tip: Need more tips for how to get an internship? When you get an interview, send all materials promptly and offer to start right away. A speedy applicant impresses any hiring manager. They’re popular ways for how to get an internship. Maybe too popular. On internship sites, you’ll battle hundreds of others for the same positions. So—don’t rely on internship finders alone. Find internships nobody’s trying for because they don’t exist. You won’t find an internship at the first company you ask. So—remember there’s safety in numbers. Target 15–20 different companies you’d like to intern at and call them all. Next step? How to find internships without internship websites? Connect with the right person. Use LinkedIn’s advanced people search to locate the right hiring manager. Enter the company name and try several job titles. You can also check the company’s About Us page. At a big company, you might be sharpening the pencils. At a small one, you’ll get more responsibility. And it's often easier to get your foot in the door! I tried to intern at the BBC and didn’t get in. So—I settled on a London marketing firm. The smaller company had me write commercials and radio dramas, plus produce and pitch shows to the BBC. I was shortlisted for a national award and for a full BBC comedy show. It was exhilarating. Pro Tip: Set up the top internship finders to grab positions for you in the background first. Then start cold-calling. You’ll double your intern search effectiveness. LinkedIn’s InMail costs money. But a connection request with an included note is free. You may find the manager’s email address or phone number on the company website. In your query, spend two sentences introducing yourself. Use one of them to share your biggest achievement that fits the company’s needs. The experts say to “be persistent,” but that doesn’t mean just bullying the manager. If employers tell you, “We don’t hire interns,” offer to be their first. I called the company I interned at and said, “How would you like a free employee for a year?” They acted like they’d won the lottery. Yet it was still a paid internship. I applied for (and got) a Watson fellowship that shelled out a hefty stipend. A letter from the company accepting my internship helped me get the money. Even “no” doesn’t mean you won’t find an internship with a company. When you get turned down, ask for an informational interview. That’s where you ask about the job and what it’s like. Be as interested as possible. Talk almost none about yourself. Why does this help with how to get internships? Being interested makes the hiring manager more likely to become your advocate. Is the answer still no? Great! That means the manager feels indebted to you. So—ask for someone else who might hire you for an internship. Chances are, you’ll get a couple contacts. Then, tell them the first hiring manager referred you. Now you know how to find internships using internship finders, job fairs, and networking. You’ve even learned how to ask for an internship that isn’t there. Next up: Learn how to get an internship a lot quicker with a personalized resume and interview. Pro Tip: After you find an internship, wrap it up right. Ask for a letter of recommendation near the end. Then send handwritten thank-you notes for a networking bonus. Now you know where to find internships. You can have the best resume on the planet, apply to 200 summer internships, and not get one response. It happens all the time. Why? Pretend you’re the one who’s hiring. Let’s say you need an assistant for your life. You put ads in internship finders. You interview ten candidates. Nine give generic answers. One names four achievements that exactly match your needs. To find an internship fast, tailor your resume to the position. Let’s say the internship values web app design, debugging, and Java skills. Designed a web app to sell t-shirts for senior project. Personal website shortlisted for an IEEE Student Website Design Award. Assisted with debugging lessons as student TA, senior year. If you don’t find internships with a resume like that, leave a comment below. I want to hear it. Just make sure to read the offer carefully and highlight the required skills. Then, scour your past for achievements that show you are the one-and-only. Do that, and you’ll stand out like Superman in a sea of Kents and get any internship you want. The above tip for how to find internships magnifies your odds of getting hired through job fairs, internship websites, networking, and cold-calling. Pro Tip: Use the same personalization tip for interviews. Learn what the internship is looking for. Then drill with practice situational questions and real achievements from your past. Use internship finders, internship websites, and regular job sites to find internships. Also definitely check your school’s internship website. Go to job fairs at your school and others. Prep well, go during slow times, and start with your last picks first to hone your pitch. Network smarter. Don’t just reach out to friends and family. Find people in the jobs you want and do informational interviews with them. Tailor your resume and interview style. You’ll find an internship faster if you can prove you’re the person for the job. Do you have questions on how to get a good internship? Still not sure how to find internships? Give us a shout in the comments! Let's get you hired fast.